Road or trail-side fruit and vegetable stalls which rely on the honesty of the buyer to pop the money into the box, are still common in some areas of New Zealand. And happily, the Nelson Tasman region is one of those areas. These stalls are sometimes as simple as a wobbly old table with a sturdy box for the money attached to it, put out beside the road at harvest time and loaded with bags of mandarins or kiwifruit. At other times they might be one corner of an apple packing shed on an orchard, where large bins of apples are delivered by tractor so they can be bagged up ready for sale. A more sophisticated variation on this theme is the stall which is a custom-designed mobile arrangement, on the back of a trailer, which is towed into location beside the road for the harvest season, providing a sort of mobile honesty box stall. Apricots, plums, lemons, nashi, cherries, walnuts and hazelnuts are common, in season. Berries, apples, pears and melons are also available. The apple harvest is generally in early February and berries are ripe from early December through to the end of February. 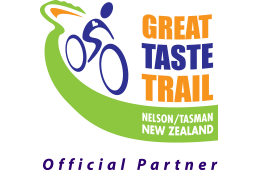 On the Great Taste Trail, riders can expect to find "wobbly table" stalls, set up at the gate of a rural property. There are permanent fruit stalls located along the trail in the Motueka and Riwaka areas.